The leafy squares of Bloomsbury are a world away from the vibrant, bustling public squares of the Levant. The farmer’s market that springs up every Thursday in Torrington Square is little like the markets of Damascus (even in happier, more peaceful days), though we can recognise common patterns. The one lying beneath our feet and extending to the far horizon is a real landscape; it is composed of rock, soil, vegetation and water, is home to an abundance of creatures and has objective past and present existences. The other is the perceived landscape, consisting of sensed and remembered accounts and hypotheses about the real landscape. In August, I spoke to a group of school children visiting UCL on an access summer school. They were a great group: vibrant, challenging, cheeky, and bright. They came from diverse backgrounds from around London, and the intention of the course was to encourage them to feel empowered to apply to UCL to study History. One of our tasks was to discuss Bloomsbury and its many histories. I stood with them in Tavistock square and introduced them to these same planes of history and of landscape that Muir had described. They spoke about their own memories of bombings in London, how it had frightened them as young children, how they had been told about it as they grew up. I stood with them at the north-east corner of the square and we looked at photographs of the day in 2005 that thirteen people died as a bomb tore through a number 30 bus. We read the names of those killed on the plaque, and shifting our gaze between the photo and the real space, felt the toll of those lives extinguished in an act of horrible aggression. There was another aspect of the physical landscape in Tavistock square that we discussed. In the opposite corner of the square, a statue gazes open-mouthed and aghast at the place those 13 people died. That statue is dedicated to the writer Virginia Woolf, whose house on the corner of that square was bombed in a different type of war, in a different type of time. The statue, erected in 2004, has no memorial link to the bombings that followed a year later. That monumental gaze was described by students as “weird”, “unsettling” and “freaky”. The clash of real and perceived landscapes was so unsettling, so unheimlich, that one of the girls said she was scared of the statue. 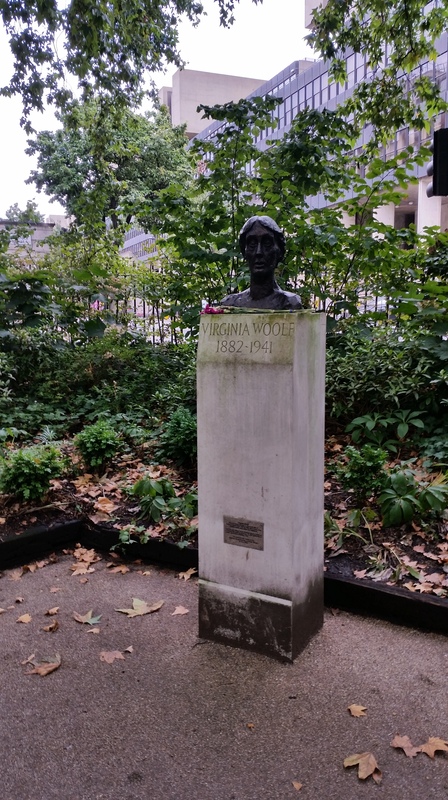 Statue of Virginia Woolf – Photo taken by me. When we returned to the classroom, I asked them about their reactions to other tragedies they had seen on the news; other atrocities, other outrages which are too often wrought on similar squares elsewhere. 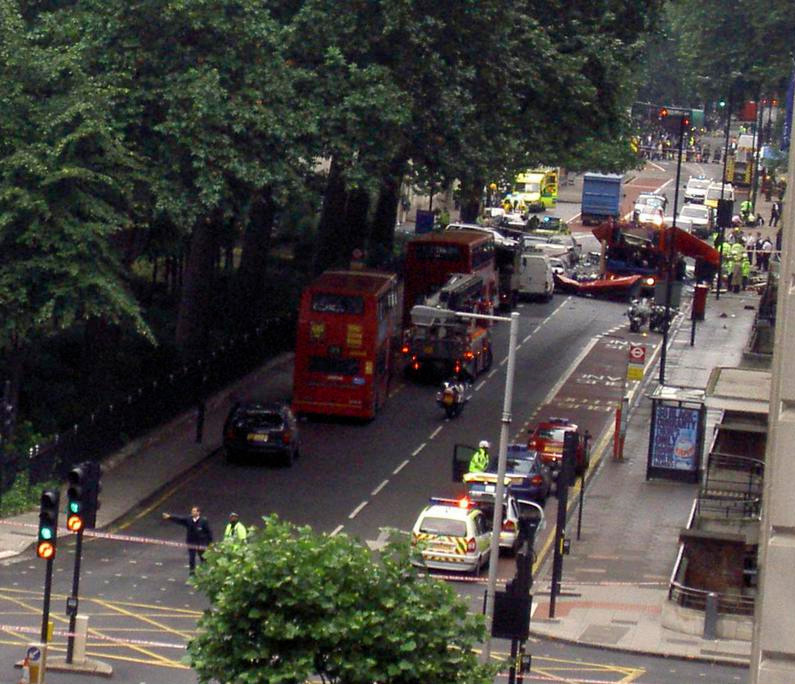 One girl hesitated when she said that thinking about those London bombs in 2005 felt more powerful, that those people felt more real than the ones she saw in the Middle East today. Another responded by talking about her Turkish relatives, and how she thought they would react to that statement. Yet another spoke of West African family who had experienced similar tragedies in unstable states. The varied backgrounds of these children came together to produce a mix of different ideas, identities, and memories. We discussed the idea of places and parity, of why it could be easier for some to see in London a greater tragedy. In this productive and constructive discussion, they questioned their own prejudices, assumptions and backgrounds. The differences they felt in the parity of these tragedies was not reflective of racism, or any dismissal of other beliefs or cultures. The difference, rather, was in their own abilities to frame events. We talked about the clash of real and perceived landscapes, and the importance of personal bonds to far off events. People should be permitted to grieve, and seek redress for specific violence and suffer without being redirected or corrected. You can raise attention to underconsidered suffering without guilting and judging people for being upset by the wrong things. […] Obviously there are salient asymmetries in power and privilege which govern this response, but it nonetheless feels dismissive & insensitive. Interrogating why we hold the ones we do is certainly productive, but judging and shaming people for not being “woke” enough is not. We (the left) need to be cautious that the reparative weighting of the suffering of marginalized people doesn’t cross into minimization. For me, the “salient asymmetries in power and privilege” are the most pressing concern. I have seen some friends criticise the move by Facebook to create a specific means of memorialising and showing solidarity with the French (through a transparent tricolore superimposed on their profile picture). Where, some have asked, are the greens of the Nigerian flag, and the blacks and red of the Syrian flag? Their quandary stung me, and led me to think on my own behaviour, emotions and response. This is a problem created by the legitimate concern that broken black and brown bodies somehow lack the same power as their mostly white, mostly European equivalents. I have no answer to this concern, but to discuss my own reaction. I think there are clear problems with corporate led commemoration, especially when it reflects assymetric power relationships. I am reminded of Facebook’s origins, of its introduction to the UK through elite universities, when you needed an institutional email address to sign up. If I’m right in working things out, St Andrews, my own alma mater (and not the most stunningly diverse of institutions) was fourth in the UK to “get” Facebook, after Oxbridge and Durham. In a situation like this, the sense is that asymmetries of power and privilege, so enshrined in the early life of Facebook, are indeed being perpetuated. This commemoration of the massacre and show of solidarity with the people of Paris is well-intentioned, genuine and good natured on the part of those engaging. Yet it would seem the issue lies in the facilitation. In the prioritisation of this tragedy over others, there is a sense of those asymmetries that was absent in the discussions I had with those school children. In other situations, I feel that criticisms of “forgetting” are perhaps less valid. I was struck by the statement that the death of swathes of Algerians in 1961 as a result of state violence had been “forgotten“. Certainly, as a scholar of French History I am perhaps more aware of these dates and events than an average media commentator. When, in 2010, I spent 8 hours ‘kettled’ by riot police in Parliament Square during the protest against the introduction of student fees, those events in 1961 gripped me with fear. Herded onto Westminster bridge, and pressed tight so that I could not turn around or sit down, we were held for nearly three hours. The ghoulish memory of that Paris massacre terrorised me. That memory and that terror was not a claim of equivalence, nor any comparison of the causes. The issues I had sought to highlight were as nought against the racist violence that saw peaceful Algerian protesters drowned. Yet, it was the approximation of the physical landscape – protesters held on a crowded bridge by riot police – which invoked the perceived landscape – the memory of that massacre in Paris – and drew my physical reaction. Duelling senses of place combined to alter my own perception of events, the memory haunting the present. The violence which marred French streets last week cannot be understood without historical context. Its very horror lies in its spontaneity, in its mundane settings, and in the obscurity of its perpetrators. The shootings that occurred in Paris were not counter-hegemonic violence. They were not coherent political messages. They were the violent and barbaric outburst of a small criminal minority. To credit the headline ideological message they grasp at is to benevolently grant coherence to the guttural defences of thieves and murderers. In part, the shock of such narratives stems not only from their violence, but their suddenness. They are unpredictable and seem only broadly related to grander narratives, so that we struggle to contextualise and rationalise the horror of attacks like those in Paris. Yet not only is the combat assymetric, between the state and members of these small cadres, so too is the perception of the conflict. Narratives of ongoing warfare constructed by small groups rely on internal validation, and the delusion that their actions address a broader cause. For these obsessives, attacks are ongoing battles in a continuing struggle. Yet for their victims and wider society, they represent percussive and episodic assaults on ordinary life. As it happens, I missed events coming in on Friday night as I was also at a metal gig in Camden, a parallel with the Bataclan that my bleary comprehension on Saturday morning found doubly haunting. The juxtaposition of Parisian streets with those I walk each day amplified the sense of shock that I felt. My own experiences of Paris framed the descriptions of horror in my own mind’s eye. As I mentioned in that January post, it was the suddenness and everyday setting of these attacks that meant my response on discovering them was immediate, and emotional. The history that happens underneath our noses ought to be the clearest, and yet it’s the most deliquescent. We live in time, it bounds us and defines us and time is supposed to measure history isn’t it? But if we can’t understand time, can’t grasp its mysteries of pace and progress, what chance do we have with history – even our small, personal, largely undocumented piece of it? I am sympathetic to Lartey’s concerns about places and parity. I am sympathetic to the concerns of my friends and colleagues that “asymmetries in power and privilege” are reflected in selective commemoration. Yet I am also reminded of the conversations I had with those school-children visiting UCL: for them, the personal connections we share with tragedy inform our reading of it, and govern its force. The intersection of real and perceived landscapes affects the parity with which we view different events in our mind’s eye. Differences in parity are not always governed by esteem, however. The immediacy of pain, and the sting of sharply felt tragedy, are instinctive responses framed as much by comprehension as belief. The horror of seeing streets like ours awash with blood, of seeing people cut down whilst enjoying themselves as we do, seem all the more acute in our imperfect grasp of the history under our noses. Yet that deliquescence, the liquid nature of the modern world, cannot lead us to complacency. We need still avoid the ‘Oh dearism’ that allows us to distance ourselves from far-off events that seem complicated or difficult. Analysing our own responses alongside the events to which we are responding is an important step. More than that, it confirms our humanity. Our sensitivity to the horrors carried out in Paris this last weekend relies on those instinctive mental processes. Yet our reactions cannot be governed by the same immediacy of instinct, and require us to pause, examine our own selves, and act in the clear light of day. R. Muir, Approaches to landscape (London: Macmillan Press, 1999), p.115. These were Year 12 students, all 16 or 17, I think, with the temerity to be born very close to the Millennium. Moreover, at present, when one searches ‘Paris Massacre’ in the anglophone Wikipedia, you are automatically redirected to the page referring to the massacre of those Algerians in 1961. In that small corner of the internet, at least, it has been far from forgotten.